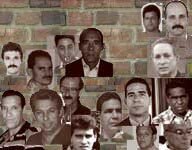 Led by former prisoner of conscience Jose Daniel Ferrer Garcia, the Patriotic Union of Cuba (UNPACU) has in the year since it was formed become one of the most active opposition groups on the island. And in response, the Castro dictatorship has reserved for UNPACU some of its most aggressive repression, arresting and detaining the group's members in a futile attempt to stamp out its efforts. Most recently, activist Roelbis Coba Sendo on Aug. 29 was tried, convicted and sentenced to 18 months in prison on supposed charges of "contempt" and "resistance." Opposition activist Yordi Garcia Founier said Coba was jailed in retaliation for his participation in a June 15 protest outside a Guantanamo police station to demand the release of two members of the Damas De Blanco who had been deported from Havana. Coba was tried and sentenced two days after receiving a subponea. During the proceedings, police arrested eight other activists while they were trying to enter the courthouse. In a separate incide, Interior Ministry officials assaulted Dama De Blanco Yudislaidis Travieso Garlobo when they tried to take her cell phone while she was walking to the courthouse.